The trial of Radovan Karadzic at the ICTY was supposed to begin this morning, but, true to his word, Karadzic decided to boycott the trial because he was allegedly not given enough time for preparation. In reality, however, it has been more than a year and three months since his transfer to the Hague – time that he spent wastefully, mainly by bombarding the Tribunal, states, and the public with his theories regarding an alleged immunity deal with Richard Holbrooke, that he claimed was somehow supposedly binding on the Tribunal (for our earlier coverage, see here, and for some discussion see here). The proceedings will resume Tuesday afternoon, and we shall see what the judges make of it. That the trial is off to a rather bumpy start is of course entirely the Tribunal’s own fault – not because it denied Karadzic adequate time for preparation, but because it allowed him to represent himself in the first place. The ICTY’s overly generous (to put it mildly) approach to self-representation, first in the Milosevic and then in the Seselj cases (see more here), quite simply allowed determined defendants to turn the courtroom into a circus. It is not just deeply flawed legally, practically, and symbolically – it also in my view rests on a mistaken psychological assumption: that the defendants in question actually wish to persuade the judges of their innocence. But high-ranking defendants want no such thing. It is not the judges who are their intended audience – they perform for the history books, and for those same besotted masses whom they once led and whose fate they still want to control. They wish to validate their own heroic self-image; the courtroom is only their final stage, and the judges a part of the decor. They do so not just because of the narcissistic, prima donna personality that is almost invariably a part of the pathological mental make-up of a successful politician/war criminal. Rather, they are in a sense perfectly rational in their irrationality. That they have nothing to gain by having counsel defend them to the best of their ability is plain – either they already know that they are guilty, or they believe that there’s a conspiracy out to get them, of which the judges naturally form part. Thus, turning back to Karadzic, it is obviously NOT in his interest as he sees it to have a speedy, efficient trial, or a trial which focuses on a narrow set of legally relevant issues. He knows how the trial will end, as so do all of us. Sure, some important issues remain open – for example, whether Karadzic could be held criminally responsible for the Srebrenica genocide. But he has just about as much chance of leaving Scheveningen as a free man as Goering did in Nuremberg. It is hence in Karadzic’s interest to prolong the trial as much as possible as he plays the part of a victim who battles on alone, heroically sacrificing himself for his people, etc., etc. In other words, he wishes to savor every last minute that he remains in the public attention, before he ends up forgotten and alone in some comfy Western prison. One does not need to be Karadzic’s psychoanalyst (pity the poor soul, if he or she exists) to see that this is how his mind works. His need to be in the center of attention has manifested itself strongly even when he was in hiding – this is where his witchdoctor persona came from (curing everything from infertility to depression through the use of pendulums and ‘human quantum energy’). Indeed, one of Karadzic’s greatest pleasures whilst hiding in his Dr. Dabic disguise was to frequent the aptly named Madhouse (“Luda Kuca”), a nationalist tavern in Belgrade, where his picture as the leader of the Bosnian Serb people was prominently displayed, and where songs were often sung in his honor. (Read more here, it’s thoroughly enjoyable if you’re into black comedy and that sort of thing). All in all, “Dr.” Karadzic is a pretty pathetic creature really – unless you are one of his many victims. And it is for his victims – the direct, like the people of Sarajevo or Srebrenica, and the indirect, his own people – that his malignancy still remains potent, and will become even more so if the ICTY mishandles his trial, as they have regrettably already done so spectacularly with Seselj. Let me try to carry this point across with some cold, hard numbers. The Belgrade Centre for Human Rights has together with the OSCE and the Strategic Marketing polling agency for many years been conducting annual surveys of public opinion in Serbia regarding war crimes and the ICTY (available in Serbian up until 2006, and in English up until 2004). The latest, April 2009 survey hasn’t been published yet officially, but let me share some of the results: 72% of Serbian citizens have a negative opinion of the ICTY and roughly the same number think that it is biased against the Serbs; 55% think that Karadzic is not responsible for the crimes that the ICTY indicted him for, while only 21% think that he is; 62% believe that he should not have been arrested and surrendered to the ICTY; 77% believe that the Serbs have suffered the most casualties during the Yugoslav conflicts, while only 13% believe that it was the Serbs who have committed the most crimes. Perhaps the most worrisome are the survey results in regard of Srebrenica, the gravest, and the most publicized, crime in all of the conflicts. Only 15% of Serbian citizens polled believe in the facts as they have been established by the ICTY – that over 7000 Bosnian Muslims civilians and POWs were executed in July 1995. 35% believe that some executions did happen, but that there were much less than 7000 (and at that probably as revenge for the killings of Serbs). 26% believe that any killings that happened only occurred in battle, or that they were fabricated, while 24% have no opinion. I imagine the situation is even worse among Bosnian Serbs than it is in Serbia. This is the audience that Karadzic is playing for, these are the people that he wishes to influence, as he has done for so long. In this parallel reality based on ethnic nationalism, the ICTY and its judges are the enemy who can never be trusted, not an impartial adjudicator that bases decisions on the rule of law. Now that Karadzic has made his opening gambit, the next move is precisely with the judges. They basically have two options open, since Karadzic cannot be tried in absentia (see Bill Schabas’s take here): either appoint counsel now, give that counsel some time to prepare for trial, and, most importantly, keep him in place untill the end of trial, while allowing Karadzic to make submissions on his own behalf, examine witnesses etc. when he wishes to do so; or, make a deal with Karadzic on a delay of the trial. Not surprisingly, I favor the first option. It does carry its risks, it undoubtedly requires some guts – and it is questionable whether the Appeals Chamber will condone it, in light of the horrible mess that it has created with the right to self-representation. But weakness is the last thing that the ICTY can afford to show at this particular moment; Karadzic must not be allowed to control the timing of his own war crimes trial. The most important symbolic message that the trials of heads of state and other high-ranking, political defendants should send is that these people who have always desired to control the lives and fates of others are no longer in control; that they, like the rest us, have to submit to some basic set of social rules. The trial of Radovan Karadzic is the last, and best, opportunity for the ICTY to have this message sent. While I agree with much of your post, how exactly is appointing counsel for Karadzic going to make it more legitimate in the eyes of Serbs or Bosnian Serbs for that matter? Especially in light of the Appeals Chamber decision in the Milosevic case that you disagree with but nevertheless is precedent here? Also, while I find your psychological analysis of Karadzic and other defendants interesting, I would wait to see how Karadzic excercises his right to self-representation before concluding that he will abuse that right as Seselj has done. (Incidentally, recall that the Prosecution during the Milosevic trial claimed that Milosevic was faking or exaggerating his hypertension to delay his trial. That may have been the case, but the hypertension was a very real threat as it turned out). There are many factors beyond Milosevic and Seselj using the ICTY podium to make speeches that have discredited the ICTY in the eyes of Serbs and many non-Serbs as well, and I am unclear as to why so much attention is being paid to the self-representation issue. Thanks for your comment. I agree that the imposition of counsel of Karadzic will not improve the standing of the ICTY in the eyes of the Serbian people. But I was not arguing that it would – indeed, nothing could actually do that. The credibility of the ICTY is basically a lost cause for the next generation or two at least. But that the ICTY cannot improve upon its own standing doesn’t mean that the messages it can send are irrelevant. If they cannot bring about reconciliation etc., they can still ferment nationalism in Serbia and Bosnia, by allowing Karadzic to control his own trial, use to perpetuate his own myth, etc. Finally, I see no reason to wait and see whether Karadzic will abuse his right to self-representation. He has already done so, and already is obstructive, by in effect blackmailing the Trial Chamber about the start of the trial through his non-appearance. It was the Tribunal’s call when the trial would start, not his. I was wondering what your view is on the opening of the Karadzic trial and also the fact it coincides with the arrest of Ejup Ganic in London and Serbia’s extradition demand. The Ganic case is very interesting in its own right, it is of course all extremely politicised. The UK Extradition Act of 2003 does provide for an option to bar extradition if it appears that the person in question may ‘be prejudiced at his trial or punished, detained or restricted in his personal liberty by reason of his race, religion, nationality, gender, sexual orientation or political opinions’. There is probably little chance of Ganic getting a fair trial in either Serbia or Bosnia, still, from a strictly legal (if there is such a thing) point of view, what kind of outcome would be most appropriate? 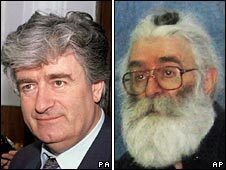 As for the start of the Karadzic trial, I really have no useful thoughts to add. He’s doing all that one could have expected him to do – saying that he is not defending himself, but the whole Serbian people (while referring to himself in the third person, of course); saying that the Serb cause was just, as if this has anything to do with whether war crimes were actually committed; saying that all of the crimes so far established by the ICTY were faked or staged. He very much fits his own cliche. We’ll see what happens with the trial as it goes on, but of course we need to always bear in mind that he is not trying to persuade the judges of anything, but is spinning a narrative for his audience in Bosnia and in Serbia. As for the Ganic extradition, I don’t know enough about the specifics to be able to comment with any confidence. The whole matter is extremely politicized, as you say. Ganic will certainly argue that he is the target of a political prosecution in Serbia. Whether this will persuade the UK courts to actually refuse Serbia’s extradition request will depend primarily, I think, on what actual evidence Serbian prosecutors have against Ganic – and we really don’t know anything about that at this point. I can say, however, that I find Bosnia’s alternative request for Ganic’s extradition to be rather odd. If they don’t even consider him a criminal suspect, how could they then ask for his extradition? And of course their whole underlying theory – that Bosnia has exclusive jurisdiction for war crimes etc committed on its territory – is entirely bogus as a matter of international law. Thanks for your prompt response. I agree with you on the Karadjic trial, it all is all played by the script. On the Ganic case, there have been two similar cases where Serbia has been putting pressure on Bosnia to prosecute alleged violations of international humanitarian law — the Sarajevo Dobrovoljacka case (the Ganic et al case) and the Tuzla Brcanska malta case in connection to which Ilija Jurisic was arrested, tried by the Belgrade District Court and sentenced to 12 years in prison. There are arrest warrants for several former military and police officials from Tuzla allegedly implicated in this latter case and they did appear before the Bosnian court, which decided that they could not be extradited because they were the citizens of BiH. These people can not leave the country because they would probably be promptly arrested just like Jurisic, actually they probably can not go as far as Republika Srpska for the same reason. Speaking about technicalities, Ganic’s situation is different. He was born in Serbia and although he never claimed Serbian citizenship, apparently, Serbia can still claim him on the basis of his old domicile. You are right, Bosnia’s request appears odd, mostly because it is much more likely that upon his return to Sarajevo, unless there is significant pressure from the international communitty, he is met at the airport by all the dignitaries and a flower-strewn carpet to boot than promptly taken into custody. What the Bosnians are probably trying to negotiate is to finally move the Dobrovoljacka inquiry further, it has been dragging on for years without any result. All in all I would say that Serbia made quite a clever move. The Ganic case diverts public attention from Karadjic’s ramblings. It also reminds the international community how messy that war was, that crimes were indeed committed on all sides. If anything good comes out of this case, it will be exactly that: Bosnia coming to terms with its own past. I am not sure what is fair, except the irony that all those people that during the four years of Bosnian war made the destiny of so many uncertain, are now destined to live, probably until the rest of their lives, in uncertainty.